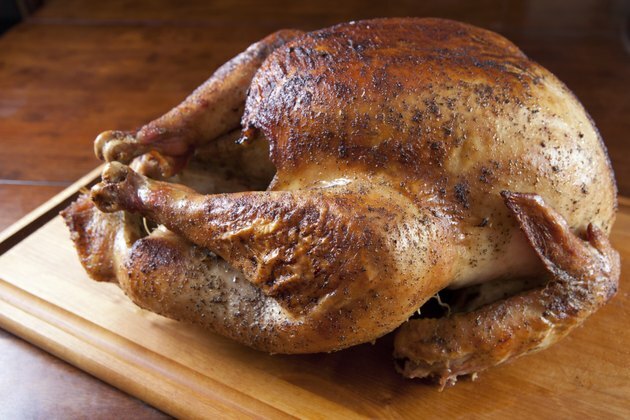 The advantage of roasting a turkey in a cooking bag is that it yields a moist, juicy turkey. However, bags are not without their problems. Paper bags are a fire hazard, and roasting bags tend to produce pale turkey skin that sometimes sticks to the bag. An alternative to using a cooking bag is braising the turkey. Braising means roasting in a steamy, enclosed environment. It is a good option when cooking a large, potentially tough turkey. Melt the butter in a frying pan, and add the vegetables. Saute them until they begin to brown. Put the vegetables and butter in the bottom of the roasting pan. Put the turkey on top of the vegetables, and add the broth. The broth should not be higher than halfway up the turkey. Cover the pan with the lid and put it in the oven. Begin checking the turkey every half-hour at the two-hour mark. Insert the thermometer into the thickest part of the thigh. Cook until the thermometer reads 165 degrees Fahrenheit. Remove the lid of the roasting pan for the last half-hour of cooking if you like brown, crispy skin. Before removing the turkey from the oven check the the temperature of the thigh, the breast, and the thickest part of the wing. They should all be at least 165 degrees Fahrenheit. Remove the turkey from the pan to rest on a cooling rack at least 20 minutes before carving. Cooking a turkey takes about 3 1/4 to 4 hours. A large turkey may take a little longer, a small turkey less. Each time you check the temperature, use a spoon to spoon some of the broth over the top of the turkey. Add seasoning to taste. Some people saute the vegetables with garlic, bacon or herbs. Some replace some of the broth with either red or white wine. Strain and use the broth remaining in the pan to make gravy. If your turkey isn't done the first time you take its temperature, wash the thermometer with soap and hot water before using it to take the turkey's temperature again. If your turkey doesn't fit inside your roaster with the lid closed, don't leave the lid ajar. Instead, cut the turkey into pieces so it fits better, or split the turkey pieces and the other ingredients between two covered roasting pans. Use a turkey lifter to remove the turkey from the pan. The broth is very hot and could splatter if you use an improvised method to lift it.